Shakedown is a microgame found in the Dance Club Rub stage in WarioWare: Touched! The objective of the game is to rub the tree with the stylus to make all the objects fall out. 1st level difficulty: There is one tree to shake. 2nd level difficulty: There are two trees to shake. 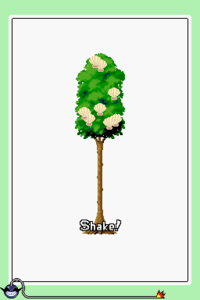 3rd level difficulty: There are two trees to shake with more items than before. This page was last edited on December 21, 2018, at 14:54.